Today, we continue the countdown to the Technique Tuesday April release! There are so many cute stamps and dies! Make sure to check out the Technique Tuesday blog for all the products featured today and full list of inspiration from the rest of the Design Team! All products (via their links) will be available for purchase starting on April 1. I have two cards to share using the Grandma Blessings stamps. 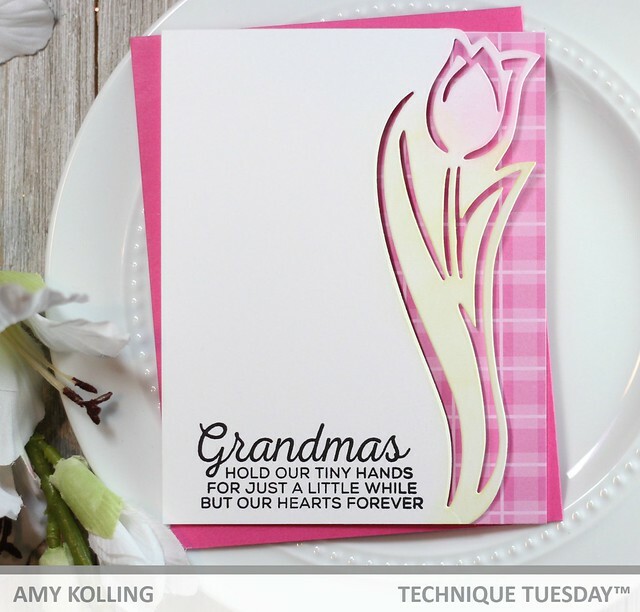 First up, I've used my favorite sentiment from this set along with this amazing Tulip on the Border Die from Technique Tuesday. I simply added some shading to the flower with Distress Oxide Inks and strip of plaid paper behind the cutout. Here's a close-up of the tulip. My second card I've created my own pattern paper by repeatedly stamping the heart image from Grandma Blessings. To create a focal point for my sentiment, I've stamped it onto a label die from Tag Toppers Crafting Dies. I topped the sentiment with the supporting bracket image with flowers. 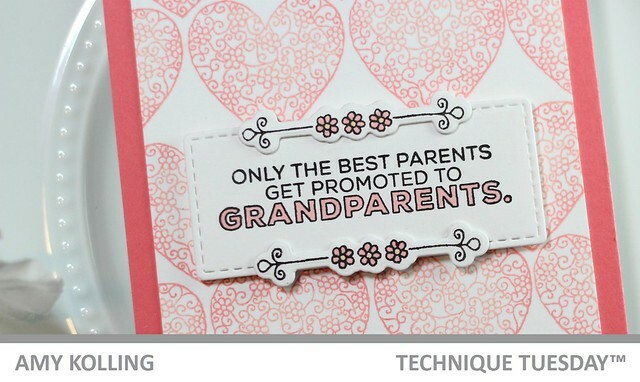 Love how this sets the sentiment apart from the rest of the card! Welcome to the SugarPea Designs 4th Birthday Bash Blog Hop! There are some amazing prizes and a fabulous blog hop lineup!! 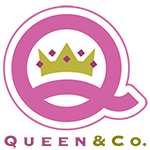 To help celebrate, SugarPea Designs is offering a coupon code: BDAY04 for customers to receive 15% off their entire purchase AND a FREE 4x8 stamp set with any purchase (valid until April 7th 11:59 EST). 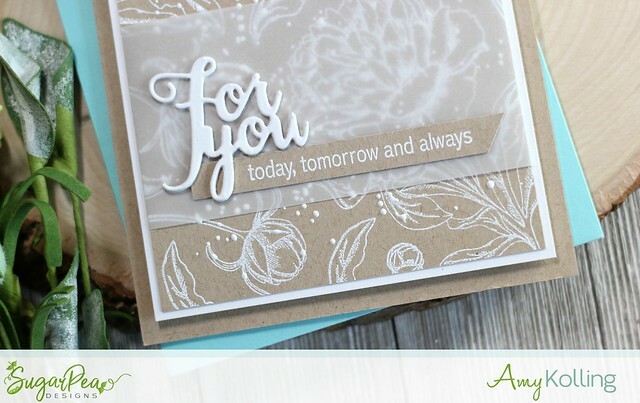 I love layering stamps and florals. 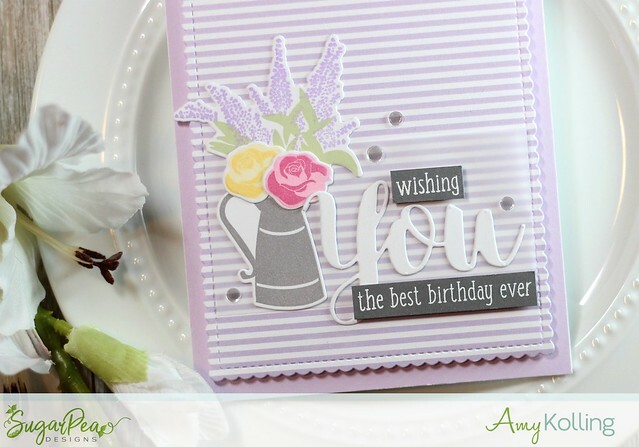 The Flowers for Mom set has some small roses and leaves along with this great pitcher image. I've stamped and die cut my images with the coordinating Flowers for Mom SugarCut dies. My images are added to a vellum strip across a panel of Spots & Stripes Pastels paper pad that was die cut using the Card Front Element Builder SugarCut. My sentiment was done using the Sweet Sentiments - You stamps and You SugarCut. 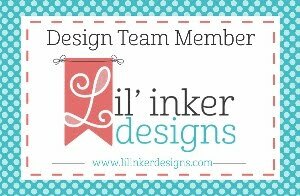 SugarPea Designs will be giving away (4) FOUR $40 gift certificates to the SugarPea Designs shop. Winners will be randomly chosen from all the comments left along each stop of the hop. Comments will close on April 7th 11:59 PM EST with winners announced on April 8th. Today starts the countdown to the Technique Tuesday April release! Make sure to check out the Technique Tuesday blog for all the products featured today and full list of inspiration from the rest of the Design Team! All products will be available for purchase starting on April 1. I am focusing on the new die set called Fresh Cut Flowers. I die cut a total of 6 images. 3 images I left the inside pieces in and colored them with Copics. I decided to add them to a white notecard that was scored every 0.5" from the top and bottom, leaving the center to place my flowers. I added tiny drops of glue to the colored inside pieces and added them using the outline image as a guide. Once done with all three, I added clean white outline die cuts. 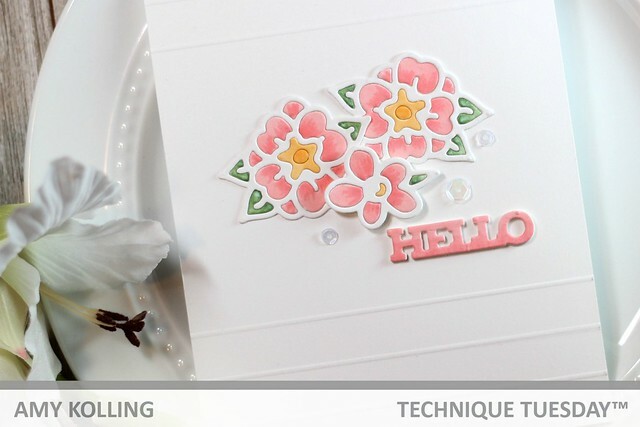 For my sentiment, I added a simple "HELLO" die cut from Cherry Blossom Crafting Dies. 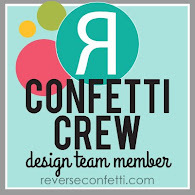 Welcome to this edition of Confetti Camera with Reverse Confetti. This challenge was to showcase unique ways to use Confetti Cuts. I decided to work with the Linked Circles Cover Panel and do a layering technique of 2 panels.. 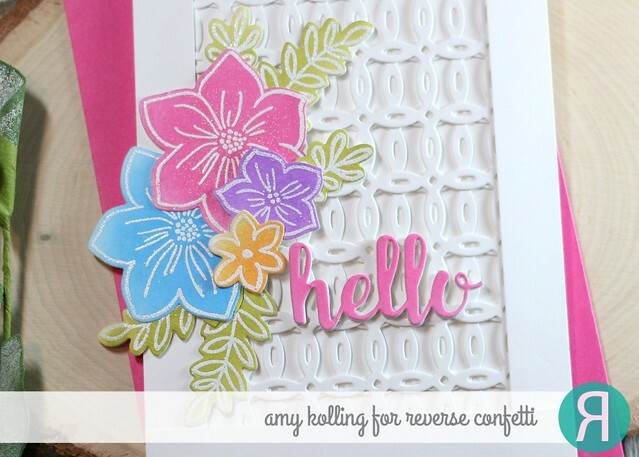 Here is a peek of my project over on the Reverse Confetti blog today! Hello! I wanted to share this bright, happy card that is perfect for any occasion using the Loads of Wishes stamp set. 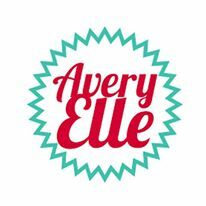 I created a rainbow background using the new Avery Elle Liquid Watercolors in Cherry, Fizz, Celery, Aquamarine, and Sugar Plum. Using a 3/4" Ranger brush, I painted using the watercolors full strength except I did wet the brush with water first. I did let each strip dry in between colors so there wasn't any bleeding of colors. Once my panel was dry, I flicked some Black Soot Distress Ink over the panel using a Tim Holtz Distress Splatter Brush. 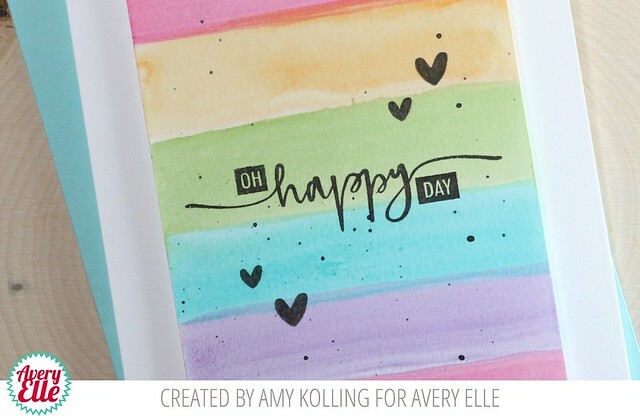 The 'oh happy day' sentiment, from Loads of Wishes, was stamped in black ink over the center of the panel along with some tiny hearts from this same set. To finish, I added this panel to a white notecard with foam adhesive. Hello! 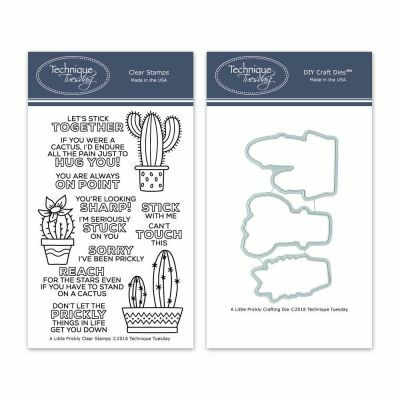 I just love this cactus set from Technique Tuesday called A Little Prickly. 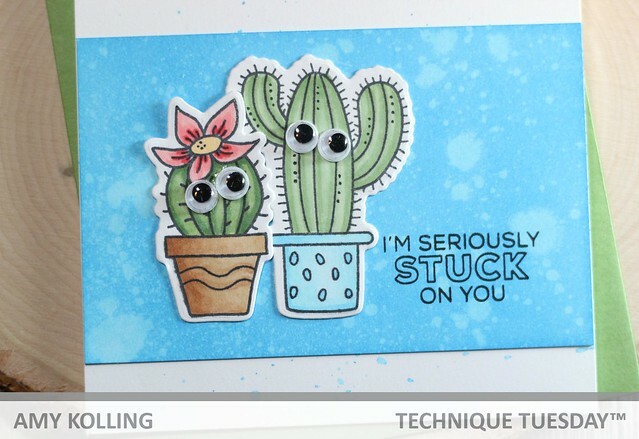 There are 10 punny sentiments that go along with the 3 cactus images. I Copic colored my little sweetheart cactuses and die cut. They were layered over a Salty Ocean Distress Oxide panel. My main notecard was splattered with the same ink using the Distress Splatter Brush. My sentiment was stamped to the right side of my cactus couple. I love how they look like they are looking at each other! Hello! 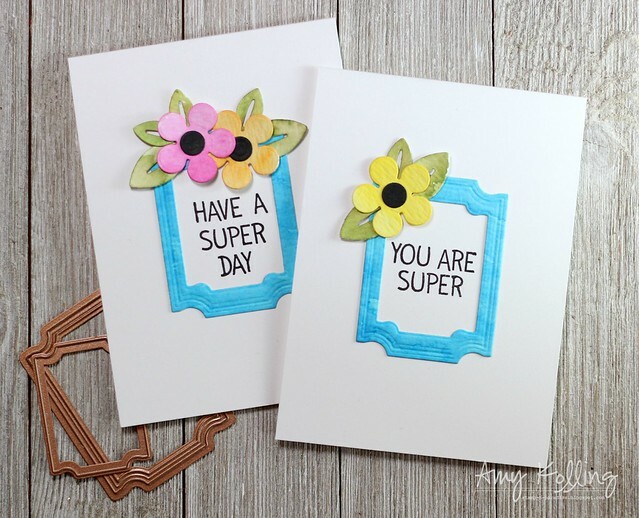 I wanted to share a simple pair of 4 bar cards using the March Small Die of the Month from Spellbinders. You can sign up to receive either the Small Die of the Month or the Large Die of the Month. They are both great values! This month's small die of the month is an elegant set of labels. I wanted to share a way to use them that wasn't so "elegant" to show how versatile they are. The labels come with dies to cut out the center to create frames! I created a pair of 4 bar cards (3 1/2 x 4 7/8) using the labels as a frame for a place to stamp my sentiment. I cut the frames out of some watercolor cardstock that was done using Distress Inks. To embellish the frames, I used the Die D-Lites Daisy 2 dies again cutting them out of watercolor paper with various colors of Distress Inks. 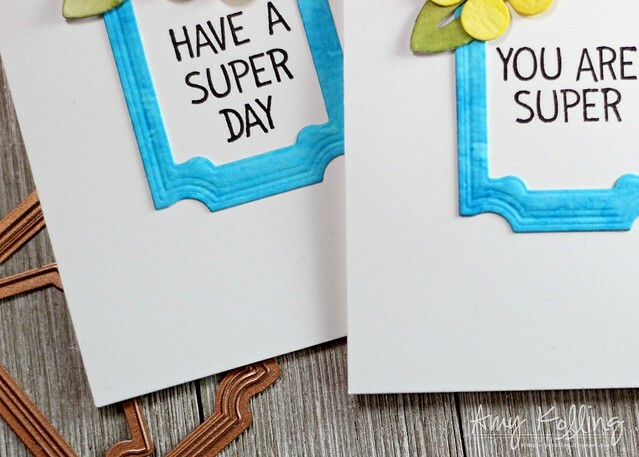 The frames were the perfect size to stamp the sentiments from a Simon Says Stamp set called Amazing Messages. These cards will be perfect to tuck inside my daughters school lunches! Make sure to check out the links above for all the clubs Spellbinders offers! Thanks for sharing a part of your day with me! Hello! There was quite the buzz at Creativation with today's set called Splash. It's just genius and adorable! I wanted to share a card using this set in a more clean and simple way. Using some blue chevron paper from the The Everyday Collection Paper Pad, I trimmed a strip down and layered it with a light pink cardstock. 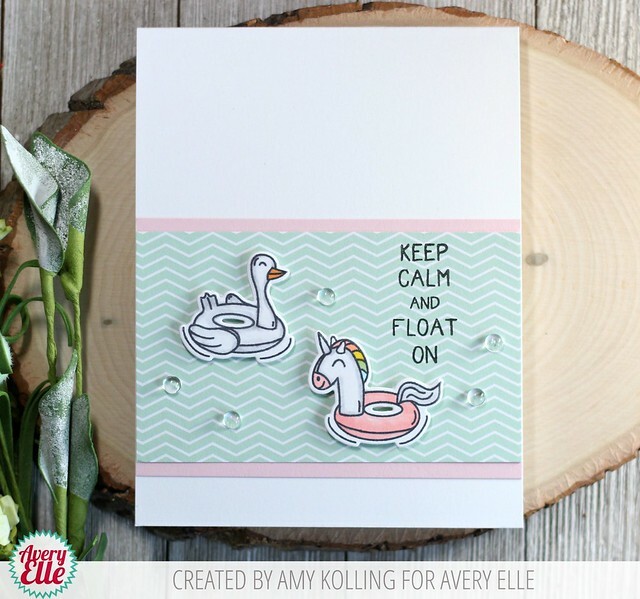 I colored the cute unicorn floatie and the swan floatie with Copics and die cut using the coordinating Splash Elle-ments. I added my floaties with foam adhesive and added some rain stone droplets for a water effect. 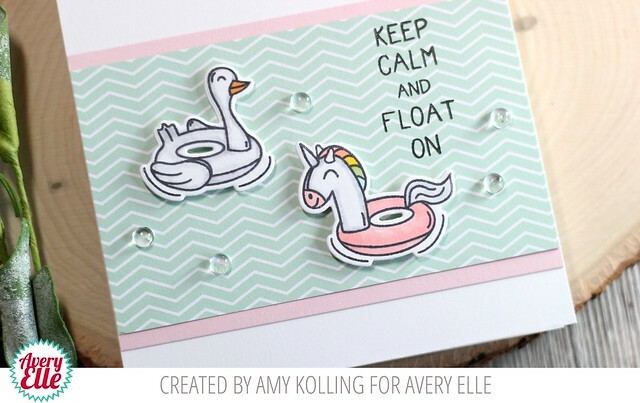 Tip: To take this card to another level, use the coordinating Splash Elle-ments with the swimming pool die! It makes for a cute shaped card! 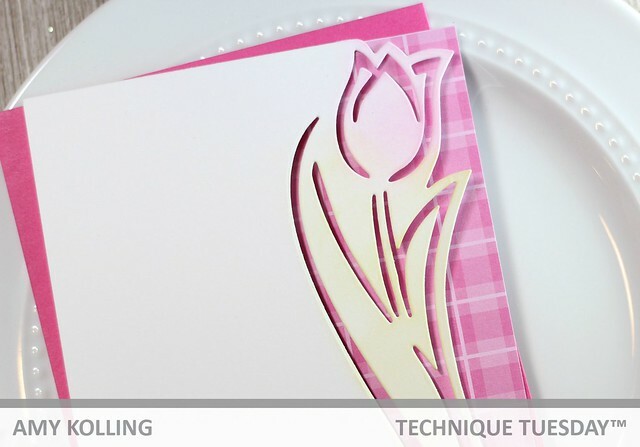 The new Pretty Peonies stamp set from SugarPea Designs is one that is so versatile. I wanted to use it for a "I'm there for you always" card that could be used for sympathy or just for a friend going through a rough time. I white heat embossed all the images from Pretty Peonies over a trimmed kraft cardstock panel. To achieve my "splatters", I heat embossed some Chunky Embossing Enamel. I love the look of this! For my sentiment, I die cut the For You word die from the SugarCut--For You Tag (older product) three times and adhered together. For the rest of my sentiment, I white heat embossed the supporting words from Heartfelt Sympathy on a kraft cardstock banner. Both sentiment elements were adhered over a strip of vellum that was wrapped behind my panel.